The reference design / prototype unit was designed for 100 watts, however this design can undoubtedly be scaled for lower or higher power capability. If you are interested in this project, please join the Radio Artisan discussion group. Note that lethal voltages can be present on various points in an antenna tuner, even at lower RF power levels. If you are not experienced with high voltage, do not risk your health or life. Safety first. 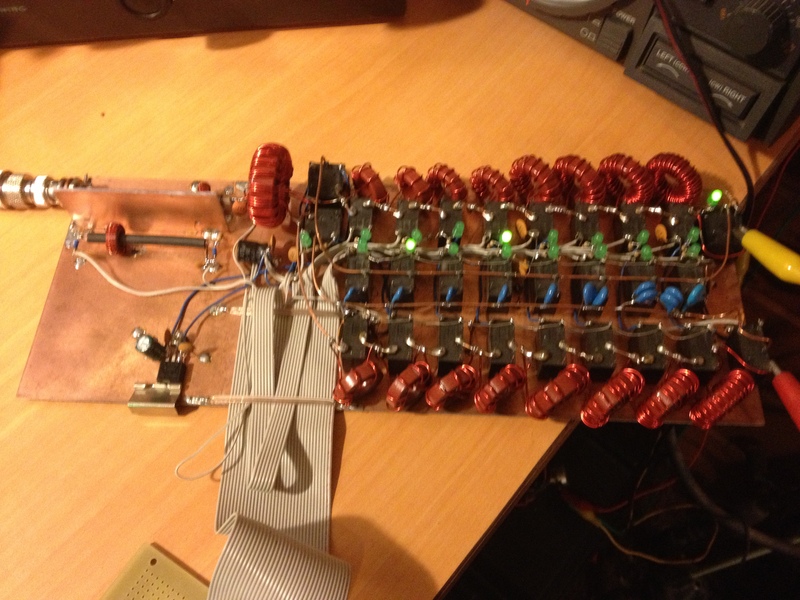 Here’s a nice implementation of this tuner by Glenn, VK3PE, with fabricated PC boards and a customized display. I have built one unit which was intended to be a prototype. It worked so well that I haven’t built another one and the prototype continues to be used in my shack on a nearly daily basis. The bottom line is, it works rather well. I would eventually like to build a QRP model with latching relays and sleep mode. If you would like to improve this code or hardware design and contribute or fork the project, please do. The Arduino controls a relay-switched matching network consisting of capacitors and inductors. The reference hardware design is a balanced L, with the capacitor bank switched between the input and output of the network to provide Hi Z and Lo Z impedance transformation. Standing Wave Ratio or SWR is sensed by the Arduino by feeding a forward RF detected voltage and a reverse RF detected voltage from an SWR bridge into two Arduino analog pins. When the Arduino senses an SWR over a configurable threshold, the unit begins a tune sequence in which numerous relay combinations are tried to find the best match within a configurable amount of time. When an acceptable match is found, the tuning routine stops. The Arduino also frequency-counts the RF signal and stores tuning combinations along with the frequencies in non-volatile EEPROM memory for future use. Before invoking a tuning combination search, the list of past tuning combinations is queried to see if a close frequency match is available. Optionally, the unit interfaces to a transceiver to periodically query its frequency which is used to automatically switch the tuning network when the band is changed or if the frequency changes more than a configurable threshold. The code can be configured for rig pass-through where the Arduino will pass through an rig commands from the computer to the rig, and vice versa. This makes the Arduino look transparent to the computer, but still allows the Arduino to query frequency information from the rig. An optional LCD display shows SWR, the currently tuned frequency, the radio frequency, and current tuning network values. The reference hardware design ad prototype I built is using an Arduino Uno and has 100 watt capability. Note that while an Arduino Uno is specified, other Arduino variants or “bare” Atmel AVR chips such as the ATmega328 or ATmega2560 can be used to save costs, conserve power, or create a more compact unit, especially if certain features are not needed, such as the computer USB interface. Schematics can be found on Github. RF power from the transmitter comes into the port currently label rf in. A tandem match direction coupler produces forward and reverse voltages which are proportional to forward and reflected power. Both of these voltages are fed to dual unity gain op amps to provide buffering. The buffered voltage is fed to analog pins on the Arduino to sense calculate standing wave ratio (SWR). The RF signal is sampled after the tandem match directional coupler. This voltage is fed to a limiter which converts the high voltage sine wave to a 0 to +5V square wave which is then frequency divided by 4 using a dual D-type flip flop. The divided signal is routed to the Arduino which counts the signal in order to detect the transmitter frequency. The RF signal then travels through a 1:1 balun which converts the unbalanced transmitter output to a balanced signal. The tuning network is a balanced L design. Inductors and capacitors are switched in and out of the circuit by relays. Additionally, the entire capacitor bank is switch by relays unto the output and input of the tuning network in order to provide impedance step up (“HiZ”) and impedance step down (“LoZ”) capability. Relays are controlled by the Arduino via its I2C bus which interfaces with two I2C expander ICs. These each provide eight output lines which feed darlington transistor buffer ICs, which in turn activate the relays. A switch is provided to interrupt the voltage to one side of the network, deactivating one leg of inductors, in order to provide an option to feed an unbalanced load. 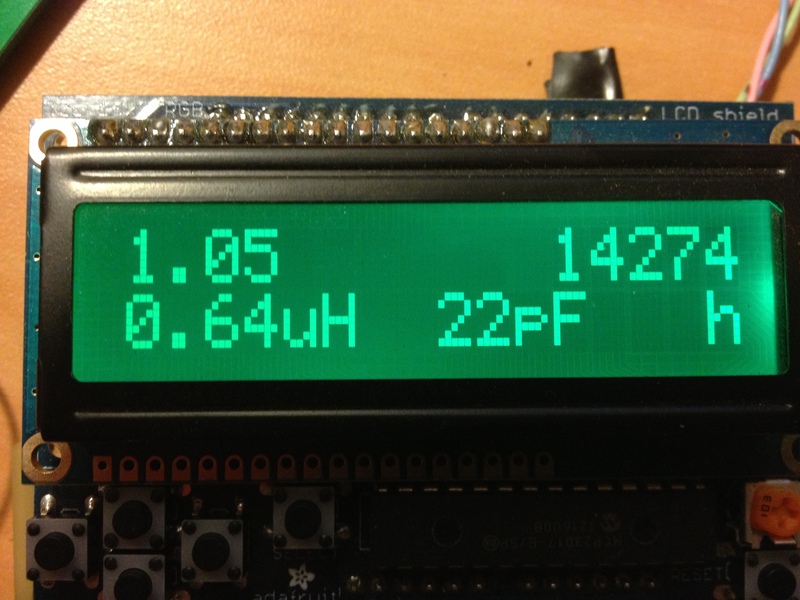 An LCD unit interfaces with the Arduino using the I2C bus. (A classic four bit interface unit can be used as well, if desired.) A bank of LEDs provide indication of relay operation and make a nice blinky light show when tuning. A momentary switch can be depressed to manually invoke tuning and a lock switch, when closed, inhibits automatic triggering of tuning. Two expansion ports provide access to all major pins for future add ons, like antenna and transmitter switching units or external SWR sensors. These pins are basically used for everything except driving relays for inductor and capacitor switching, antenna switching, transmitter switching, and Hi Z/Lo Z switching. The pin definitions are most self-explanatory and pins can be substituted as long as the pin has the appropriate capabilities (i.e. analog). Note the rig TX and RX lines are for a SoftwareSerial RS-232 port. These activate various serial port messages for events. The most useful one for code troubleshooting is DEBUG_STATUS_DUMP which can be used with the CLI S and P commands to get an instant status of the tuner. Enables support for the Adafruit I2C RGB display. Comment out the LiquidCrystal declaration when using an I2C display. Note that the I2C interface pins are not configured in the code, these are “hardcoded” into whatever Arduino you are using. Enables base serial port functionality. Activates a basic command line help menu that is accessed using a ? (question mark). The help menu items that are displayed depends on what functionality is enabled. Enables the command line interface or CLI. Some commands are dependent on what features are enabled. See Command Line Interface below for details on CLI commands. This feature declaration is going to be deprecated. The frequency counter will be a standard required piece of hardware. This pin could be used to drive a relay or transistor that activates and deactivates ancillary circuits in order to conserve power. This feature activates rig interface functionality. The rig interface retrieves frequency information from the rig in order to perform autoswitching in receive mode. It also supports commands to the rig via the Command Line Interface to invoke tuning. Read the Rig Interface section below for details. Thus feature reads the rig frequency regularly and will switch the tuner to the closest stored match when the rig receive frequency / band is changed. This feature passes commands from the computer coming into the USB port and forwards them out the rig serial port, and also sends responses from the rig back to the computer, effectively making the Arduino look transparent to the computer. This allows computer logging programs to continue to control the rig and also allows the Arduino to query the radio. This feature seem to work best when serial port and rig port are set to the same baud rate. (Probably some optimization is needed for this code.) Note that you cannot currently use this feature and FEATURE_COMMAND_LINE_INTERFACE simultaneously, however a future update will allow multi-native serial port units like the Arduino Mega to support both a computer rig pass through port and a serial command line port. Arduino Uno, Nano, Mega, etc. There are undoubtedly hundreds of suitable relays, but these are just some suggestions. The rig interface functionality currently provides two features: tuning autoswitching (when the receive frequency is changed, mainly when bands are switched), and automatic invoking of transmitter tune mode. 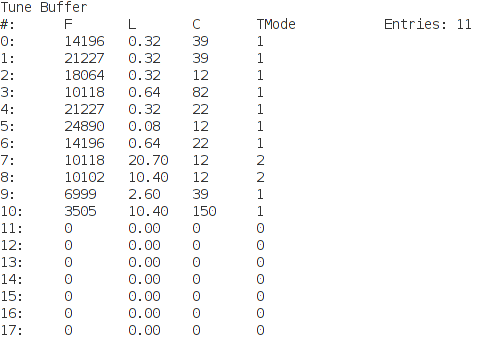 There are several configuration parameters available for tweaking. Note that rig 0 in the code is actually rig 1 in the user interface, rig 1 is rig 2, etc. Various rig interface settings are in k3ng_rig_control.h . The following lines in k3ng_rig_control.h determine what rig support is compiled into the code. Naturally, more rig types consume more memory; comment out any unneeded rigs. As of this writing, Yaesu support is working, and I haven’t had the opportunity to test Kenwood. Icom, Elecraft, and other major rigs and vendors will be supported. Extensive debugging options are provided. These should only be enabled if troubleshooting an issue or working on code as any enabled options take up memory and can slow tuning down. DEBUG_COMMAND_BUFFER – various diagnostics related to the command buffer. The command buffer is for relay operations, not the Command Line Interface. DEBUG_REAL_DEEP_STUFF – various log messages when entering subroutines. Probably not of much use to mere mortals. Bugs and feature requests are documented and tracked on GitHub. This is nice! I was planning the same thing for this winter. Just started off with arduino and up till now made a SWR/PWR meter and a simple rotator control is nearly ready. Hi pse post more info on your project. I’m interested in this project. Sounds similar to the LDG tuners. I’ve has the chance to open one up and was shocked how little there was in there, considering it could handle up to 200W. Just small coils, capacitors and a few relays with what looked to be a pic uC. I would be interested in working on this project with you if you’re open to it.